We focus our research on wireless transceiver integrated circuits, antenna and electromagnetic wave propagation, and materials science and engineering for integrated circuits. We would like to contribute to the development of early breast cancer detection by use of these technologies. Impulse-radio ultra-wideband (IR-UWB) CMOS transceiver integrated circuits are developed for 3-dimension integration data transmission and cancer detection. 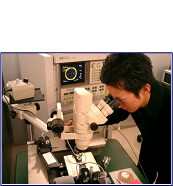 Figure 1 shows a picture of a student who is measuring antenna characteristics by use of vector network analyzer. 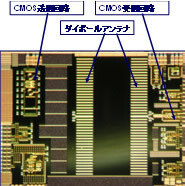 On-chip antenna can be integrated with CMOS circuit as shown in Fig. 2. It can be achieved when signal frequency increases from microwave range to millimeter wave range and the pulse width decreases to psec order. In our laboratory, new antenna design and miniaturization as well as circuit design of IR-UWB CMOS are conducted. A popular technique for breast cancer detection is X-ray mammography. However, it causes X-ray radiation to women and severe pain in breast. In order to solve the problem, we have been developing a new technique for early breast cancer detection, which utilize IR-UWB radar technology. Figure 3 shows confocal imaging of breast cancer by IR-UWB. In our laboratory, we develop early breast cancer detection technology by designing antenna array, designing CMOS circuits and building total system with vector network analyzer and electromagnetism. It is necessary to develop not only circuit design technique but also electronic materials as a part of integrated circuits. Figure 4 shows a cross section transmission electron microscopy of self-assembled porous silica film for use in CMSO integrated circuits as a low-k interlayer dielectric film. 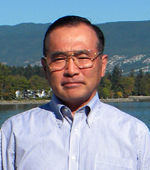 High-k materials for memory devices are also developed in our group. Fig.1. Antenna propagation measurement by use of vector network analyzer. Fig.2. Photograph of UWB-CMOS integrated circuits with on-chip dipole antennas . Fig.3. Confocal imaging of early breast cancer detection. Fig.4. Cross section TEM micrograph of self- assembled porous silica film.